Casseroles seem to be frequent, comfort food guests on our family's dinner menu during colder weather months. Many of us love warm, hearty casseroles because they just seem to take us back to our childhood and remind us of Grandma's kitchen. While I certainly love the comfort food aspect of casseroles--the busy mom in me loves the convenience of them. 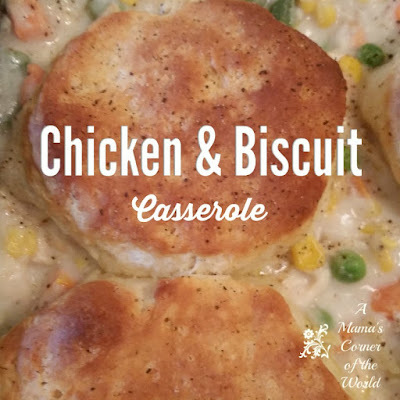 The Chicken & Biscuit Casserole recipe is one that I have made for (I can't believe I'm saying this) over 20 years! It's fast and easy to put together ahead of time on busy evenings and it bakes in minutes. Preheat Oven and Prepare Baking Dish. Preheat oven to 425F. Lightly spray 2 Quart Baking Dish. with cooking spray or grease lightly. Make the Gravy for the Casserole. Melt the butter in a large saucepan over medium to high heat. Add the flour, salt, pepper & garlic and stir until the flour is blended into the butter and beginning to "cook" or darken slightly. Usually just a couple of minutes. Decrease the heat to low and gradually whisk in the milk and the chicken broth, stirring constantly--being sure to break apart any lumps that form. Cook and stir until the gravy thickens slightly. If the mixture thickens too much too quickly; simply add a little more milk or broth to thin it. Pre-Cook the Casserole Ingredients. Add the chicken and vegetables to the gravy mixture and stir to combine. Warm the ingredients, stirring often, until the frozen vegetables thaw and warm. If you aren't using frozen vegetables--or your vegetables are already thawed, simply combine the casserole ingredients in the saucepan or a mixing bowl. Build the Chicken & Biscuit Casserole. Pour the casserole mixture into the prepared 9x11 inch baking dish. Top with the unbaked biscuits--spacing them evenly across the top of the casserole. Bake & Serve. 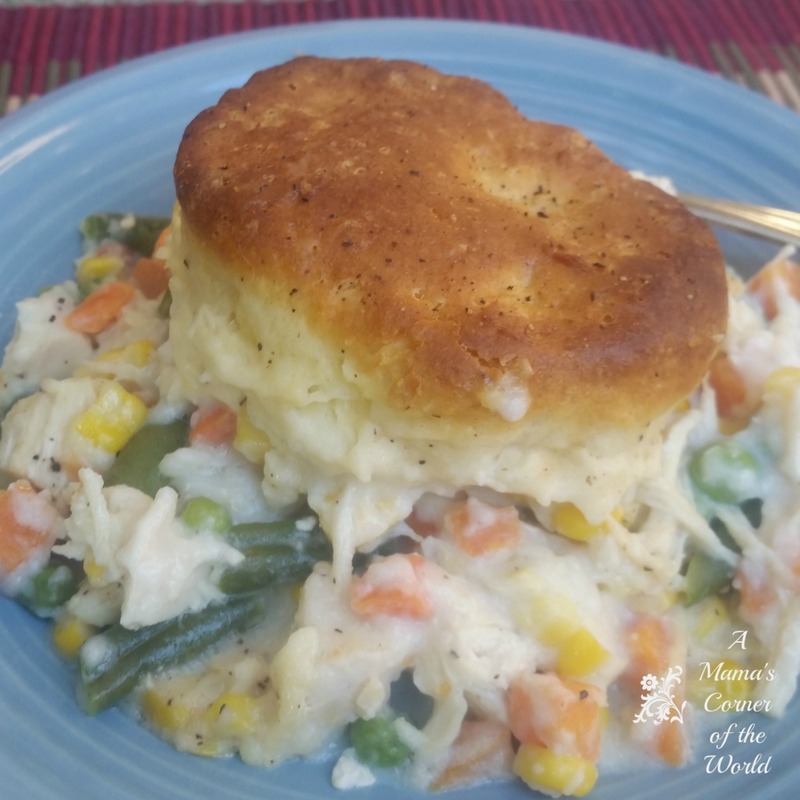 Bake the chicken & biscuit casserole for 15 minutes or until the biscuits are golden brown. Serve with a salad or fresh fruit. No time to make the gravy? Whisk 2 c. of milk into a can of cream of chicken soup. This makes a quick and easy "gravy" for the casserole. Make this casserole ahead of time, cover and store in the refrigerator until ready to bake. Disclosure: This is not a sponsored post. Many of our posts do contain affiliate links and we may receive slight compensation from purchases made through those links. We only link to products that we personally use and recommend in our recipes or projects.